Live chat with Neil deMause and Heywood Sanders today, 1pm ET, submit questions starting … now! More news after I run some errands [UPDATE: More news is now posted below on the main page! ], but in the meantime, all the news you really need for today is that FoS convention center correspondent (and University of Texas professor, and book author in his own right) Heywood Sanders and I will be holding a live chat in the comments section of this very item starting at 1 pm today. Anyone can attend, anyone can ask questions, and anyone can ask questions starting now, though Heywood and I won’t be answering them until 1. Chat with Heywood Sanders! And me! Thursday, January 22, 1 pm Eastern! Welcome, one and all, to the reboot of the Field of Schemes live chats. As promised earlier, I’ve decided to start opening these up not just to FoS Supporters but to anyone who happens by, since they’re more fun with a fuller room. And I am very pleased to announce that joining me for the first chat of the year will be University of Texas-San Antonio economist and Convention Center Follies author Heywood Sanders to talk about the convention-center end of the public subsidy racket, though he knows a fair bit about stadiums as well. We will be convening here on Thursday, January 22 at 1 pm Eastern, and sticking around for an hour or two, depending on how many questions we get. I’ll be setting up the chat item in the morning, so if anyone can’t make it for the live event, feel free to leave your questions in comments and we’ll get to them as we can. Since today is a day for celebrating all the people who do all the work and don’t get paid enough, it’s a good time for me to celebrate the people who enable me to labor on this website and actually get paid a little: you, my readers. And while every eyeball that lingers on an ad helps out a bit, the biggest thanks go to those of you who directly contribute to this site by becoming FoS Supporters, whether mini- or maxi-. At a time when corporate journalism remains unsure about whether it actually wants to pay people to report on things like stadium shenanigans, I’m increasingly grateful for your willingness to chip in so that I can keep this site going and my lights on, all at the same time. Which reminds me that I haven’t done a supporter chat in a while, and we have a bunch of new members to invite into the inner sanctum, so let’s do next Monday, September 8, at noon Eastern time. (I’ll try to stick around until around close to 2 pm, for late-rising West Coasters.) I’ll send out a password via email shortly, and you can post questions or discussion topics starting early that morning on a password-protected item that will appear here. Please join in if you can — it’s way more fun with a crowded room. Live chat Monday at 1 pm ET, really this time! Sorry for dropping the ball on yesterday’s planned live chat — was already trying to keep too many balls in the air this week, then computer problems completely did me in. Let’s reschedule for next Monday, June 23 — yes, just double-checked, Monday is the 23rd — and I’ll send out passwords via email shortly. Live chat this Wednesday, plus: buttons! 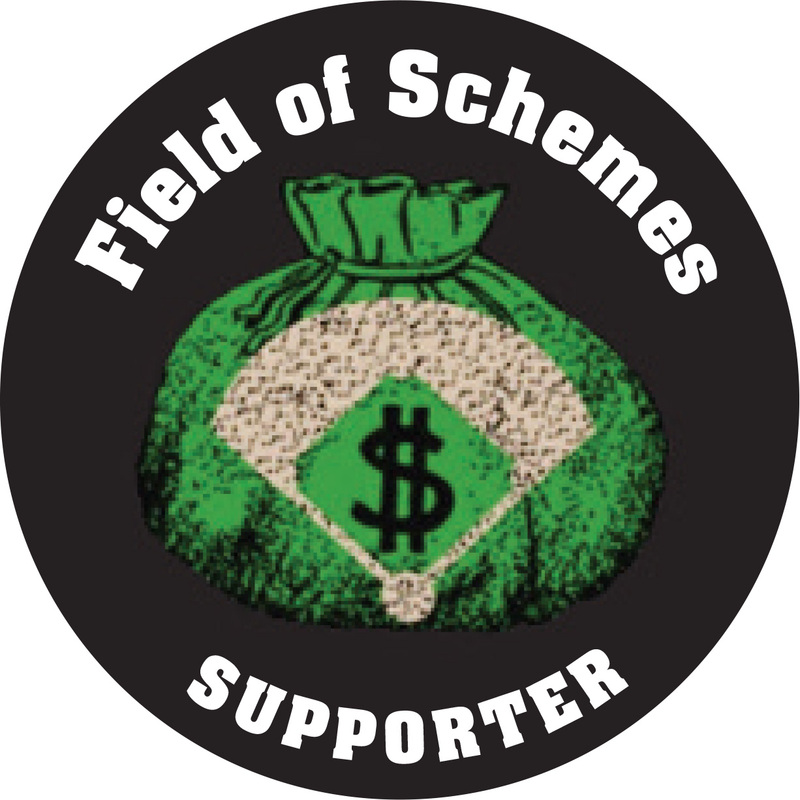 And speaking of membership having its privileges, the long-awaited Field of Schemes Supporter buttons are finally here on my kitchen table, and will begin winging their way to site supporters shortly. If you can’t live without one of these, or just want to help me keep devoting my time to reporting the latest stadium and arena news for this site, sign up today! And away we go on this inaugural run. I’ll be here in the comments thread starting at noon Eastern time, but in the meantime, feel free to post questions, discussion topics, or tabouleh recipes to get us started. Way back when I was soliciting Supporter memberships back in December, one of the perks of membership that I promised was monthly live chats with me about whatever y’all wanted to talk about. (Presumably something related to stadium and arena funding, but if somebody wants to discuss the relative merits of Feelies albums, I’m game.) I spent some time looking at chat plugins, most of which seem to be designed for people doing online tech support, then eventually got distracted by reporting stadium news and didn’t get back to it. Anyway, I’ve decided enough fumfering around: This Friday, I’ll be conducting a members-only chat from noon to 1 pm Eastern time, on this site. To make things simple, the chat will be conducted in the comments section of a password-protected post (password will be emailed out to Supporters momentarily), and will afterwards be archived for all to see. So as not to leave non-Supporters out, you can play along by submitting topics for discussion in the comments section of this post, and I’ll do my best to address them as time allows on Friday. Unless we get caught up in heated The Good Earth vs. Crazy Rhythms debates, in which case all bets are off. In connection with my stadiums essay in the new edition of Baseball Prospectus and my followup article on BP’s website, I’ll be doing a live chat at baseballprospectus.com this Thursday from 1-3 pm. If you have a pressing question about the A’s or Marlins (or, for that matter, the Gwinnett Braves) that you can’t wait to ask, you can pre-ask questions and I’ll reply on Thursday. And if you’re in the New York City area, I’ll be appearing on a panel discussion with BP authors Kevin Goldstein, Steven Goldman, Jay Jaffe, and Cliff Corcoran, on Thursday, March 12, at 6 pm, at the Barnes & Noble on 5th Ave. and 18th St. in Manhattan. (I can remember when that was the only Barnes & Noble store – yes, I’m that old.) I’ll see about having a stock of Field of Schemes copies on hand as well, if anyone wants me to deface them with my signature.